MacGregor, part of Cargotec, has announced that it is now building one of the most advanced fibre-rope cranes on the market. The MacGregor FibreTrac crane will have a 150-tonne safe working load capacity and will be ready for testing during the first quarter of 2018. “MacGregor launched its fibre-rope crane range in 2016 and as part of demonstrating its capabilities to the market, we have entered into a programme to build, certify and validate the world’s most advanced fibre-rope knuckle-boom crane that the market has yet seen,” says Høye Høyesen, Vice President, Advanced Offshore Solutions at MacGregor. The crane has been designed and will be built to comply with the latest DNV GL lifting appliance, fibre and rope manufacturing rules. MacGregor intends to provide the first system fully certified in compliance with DNVGL-ST-E407 (deployment and recovery system). “Compliance with DNV GL’s strict regulations should provide end users with even greater confidence in the long-term use of this technology for this purpose,” he adds. 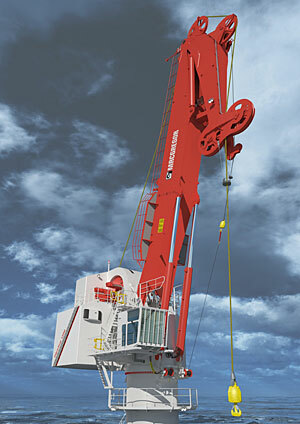 The crane will incorporate many unique technologies including the Parkburn Deep Water Capstan with storage winch capable of accommodating 4,000m of 88mm rope. It will use Lankhorst’s Lankodeep fibre rope made from DSM Dyneema’s DM20 XBO fibre with DNV 303 certification. The rope will be connected directly to the crane hook using a socketed termination from Applied Fiber. The crane will also feature an advanced rope monitoring and management system that maximises rope lifespan and provides clear lift line status information for the operator at all times. It will be controlled using MacGregor’s latest control system with the added advantage of providing real-time data feedback to onshore locations using the MacGregor “OnWatch” feature. The MacGregor fibre rope solution can also be retrofitted on existing cranes as well as stand-alone winch systems, and is available with both hydraulic and electric drive options.